John Wick TV Show Could Be Coming as a Prequel | Nerd Much? A John Wick TV show could be on its way. According to director Chad Stahelski, it would act as a prequel series. Does this mean we get a young Keanu? During a press event for John Wick: Chapter 2, Stahelski spoke with /Film about his idea for a prequel. Originally, the John Wick sequel was going to act as a prequel story, but “it just didn’t fit quite where we’re at.” Instead, Lionsgate feels like that story might better be adapted on television. 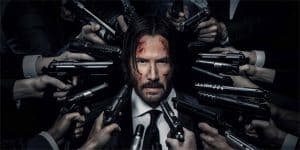 According to Stahelski, he and screenwriter Derek Kolstad “basically almost have a prequel written.” Because of the creative freedom that television provides, Lionsgate is “very interested” in doing a John Wick TV show. “I think in TV you could really expand on what that is, and greater than we could in just a two-hour film,” said Stahelski. With the first being such a surprise hit, we are excited to see more. Hopefully, John Wick: Chapter 2 will be every bit as refreshing as the first film.